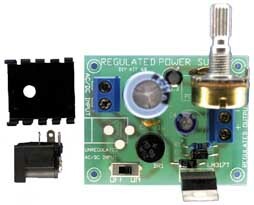 Variable Power Supply Kit – CK0402. Soldering required. Variable Power Supply Kit. 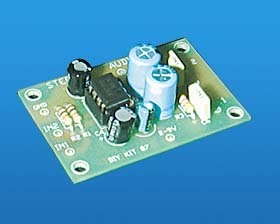 A very basic power supply that can be adjusted over a range of about 1.5 to 30 volts DC @ 2 Amps. This is a text book circuit using an LM317, which is a 3 terminal regulator in a TO-220 package. 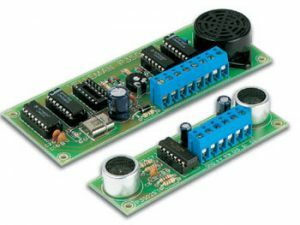 Input can be either AC or DC; DC input must be at least 2.5 V above the required voltage output. Variable Power Supply Kit. 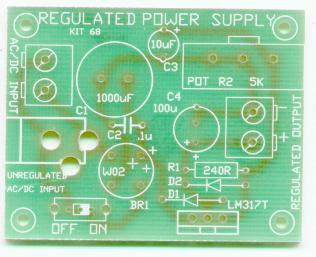 A very basic power supply that can be adjusted over a range of about 1.5 to 30 volts DC @ 2 Amps. This is a text book circuit using an LM317, which is a 3 terminal regulator in a TO-220 package. Input can be either AC or DC; DC input must be at least 2.5 V above the required voltage output. You can use a LM338T for up to 5 amps of current. We do not have the LM338T, but you can get one at just about any component supplier – DIY K68. Input Voltage: AC or DC (32 Volts Max) has to be 2 volts above desired max output voltage. 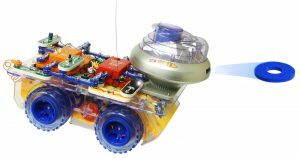 Not intended for use with Line or Mains Voltage (AC). 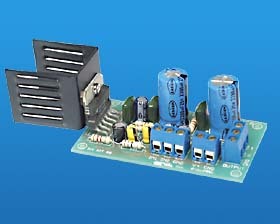 Outputs up to 30 VDC at 2 Amps.